I am not a true kaladkarin if I won't be able to go far north to visit restaurants. And since I am, I accepted an invite for a mini food crawl at Ayala Vertis North. Our first stop that afternoon was Kureji. Kureji is a new homegrown restaurant that opened in January 2018. The restaurant is more commonly known for their ramen, just not the one you are used to. 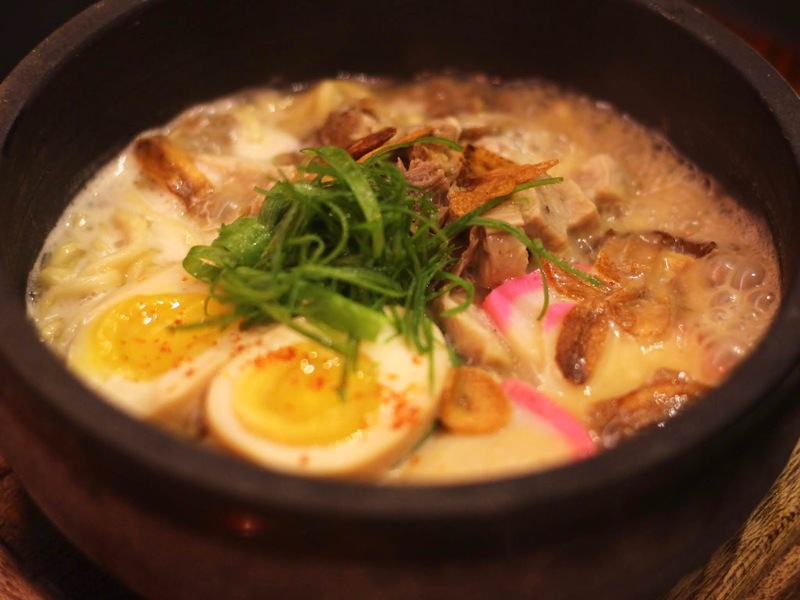 Here at Kureji, they serve their ramen sizzling hot in a stone bowl, which intensifies the aroma from the broth and gives the noodles a slightly different texture. Kani Mango Salad. One of the starters we had to kick off our meal was the kani mango salad. It's a mix of kani, carrots, greens, mangoes, and sweet soy sauce, topped with leeks, nori, and a hint of togarashi. Although it's a very common appetizer in Japanese restaurants, Kureji's kani mango salad did not disappoint as it was delicious. The mangoes were sweet, and the mayo was just the right amount. Potato Salad. The potato is a starch that no amount of guilt can ever make me give up. The potato salad is no exception. I loved that the potatoes weren't purely mashed to make this salad. There was also a hint of wasabi in it that gave just a bit of an after-taste. Edamame Kimuchi. 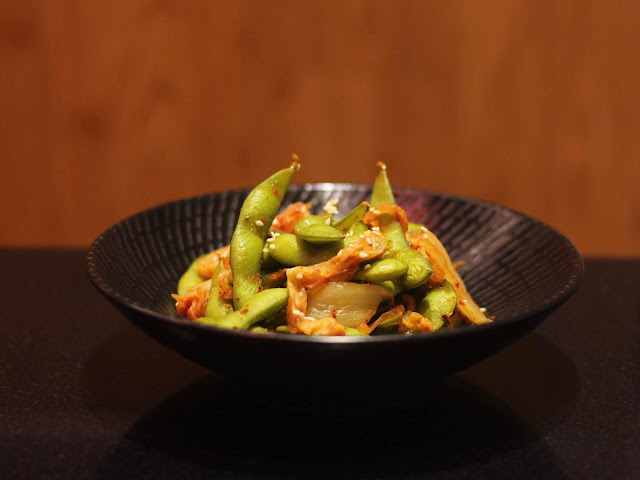 This starter is made with steamed edamame beans tossed with Kureji's special kimuchi (like kimchi, but Japanese version) for an added kick. It was a great snack while we were waiting for the rest of our orders as it is light, plus the kimuchi sort of fueled my appetite. Gyoza. Kureji's best seller, the gyoza dumplings are freshly made daily. It's juicy on the inside, and soft on the outside. The sauce on the side takes their gyoza to a whole new level. Here's how the sizzling ramen works - they serve it sizzling in a hot bowl with some broth on the side and a timer. When the timer is done, you pour over the remaining broth and watch it sizzle, while smelling all the good flavors that you will soon taste. Sizzling Tomato Seafood Ramen. The sizzling tomato seafood ramen is a flavor that is not very common to ramen joints. It's one that has a hot of seafood ingredients such as salmon, squid, and shrimp, plus some kani, kimuchi, and thick noodles in a tomato seafood tori paitan broth. It's something that is not hard to appreciate. What I really loved about it was the thick tomato paitan broth that had quite some spice - not the kind that burns your taste buds, but the kind that just lingers on the lips. Sizzling Pulled Chashu Garlic Miso Ramen. This ramen is a more common one in Japanese restaurants, and although I liked the tomato seafood ramen, the garlic miso ramen is not far behind. This ramen is topped with tender pulled pork chashu, menma, noodles, and aji tamago in a miso garlic tori paitan broth. The flavor of the garlic in this ramen was really powerful. So if you're into garlicky food, then you might be interested on this one. Sizzling Gyudon. We thought we already had the best we can after trying out two ramen specials from Kureji, but boy we were wrong. The sizzling gyudon really took us by surprise, as no one expected it to taste good, or different from the ones we have at other Japanese restaurants for that matter. It's made with beef sukiyaki, shiitake mushroom, spinach, and carrots with Japanese rice, and topped with fresh egg. It was a mouth-watering dish, indeed. Although I had to cross EDSA with all the crazy Saturday traffic jam, I am thankful that I did so for Kureji - The House of Sizzling Ramen.